It's one thing to go over the top, it's quite another to go so far over the top that you start going back down the other side. But the third-person action game Bayonetta doesn't just go that far, it keeps on going until it swings back around and goes over the top a second time. It really is just that ridiculous. That gloriously, unrepentantly ridiculous. Spearheaded by Hideki Kamiya, who directed the original Devil May Cry (and it shows), Bayonetta casts you as an acrobatic witch with mad kung-fu skills, an itchy trigger finger, and hair that would make Crystal Gayle jealous. Well, assuming Gayle's hair was so long that she could smack people with it when she wasn't wearing it like a skin-tight cat suit. Oh, and did we mention Bayonetta's high-heeled boots? The ones with pistols strapped to them so that she can shoot baddies while doing spinning handstands? This level of ridiculousness permeates all aspects of the game, from the illogical story to the wild moves Bayonetta does when she's beating someone up. And this isn't just Japanese-flavored weirdness, either (though it is very Japanese). Bayonetta has the sassy moves of a drag queen with a flirty attitude to match, her magic attacks have her hair forming a giant boot that stomps her enemies or a dog's head that mistakes them for Puppy Chow, and her method of regaining health or getting an added boost of power is to lick a lollipop. In case you haven't gathered as much, Bayonetta's sexuality is rather overt. We'd say that her skintight outfit leaves nothing to the imagination, were it not that her hair attacks actually do answer a few lingering questions about her choice of undergarments. Or lack thereof. You can even hit a button that will tease your enemies while she strikes a seductive pose, and doing so restores some of her magic energy. Even the acting is mozarella-covered cheddar. Sounding even more scripted than Juno, the game's dialog is laughably bad and terribly pretentious, and all the better for it. It really doesn't take itself seriously, as evidenced by the vocal stylings of your occasional sidekick Enzo, who sounds like Joe Pesci doing a mocking impression of Mel Gibson's playfully mocking impression of Joe Pesci. As a result, this game's ridiculously over-the-top vibe may be too much for some people. You not only need to be a fan of Devil May Cry hack & slash & shoot-type games to know what you're supposed to do, but also need to be able to tolerate—nay, find the humor in—nonsensical silliness to really enjoy this game. If you do, however, man are you in for a treat. With fast action, tons of crazy moves, and unforgiving enemies, this game is not only the polar opposite of dull, it hardly gives you a chance to breathe. Good thing the controls are very, very responsive; doing some of Bayonetta's more outrageous attacks are not only effective, they're fun to watch, too. Fans of hack & slash action games will seriously enjoy this very wild ride. Though it does help that the game's graphics are as visually stimulating as the action. Not only are Bayonetta's attacks so physics-defying that they're like seeing Cirque du Soleil in space, but they're also are so fast and frantic, and peppered with fireworks of sound and color, that the game is a sensory overload akin to watching a Pink Floyd concert from the front row through a kaleidoscope. There is one viewer warning, though. Bayonetta is clearly not made for casual gamers. This is not a game for people who just mash the buttons, hoping that something cool will happen. Unless you play on “Super Easy,” you'll have to master the often complicated button combos to make Bayonetta do her cooler moves, otherwise you won't last very long. Especially when facing off against bosses who are large enough to borrow sweaters from Godzilla. 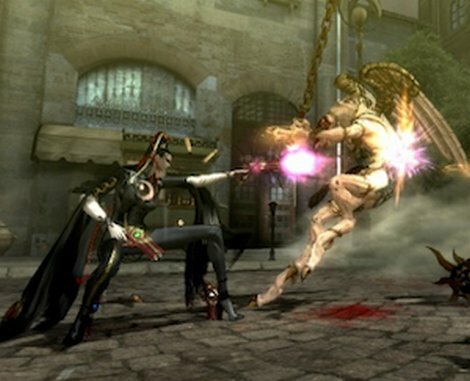 In fact, with enemies who tower over you, the reliance on button combos and power-ups, and you getting bonus points for how well you do in many encounters, Bayonetta ends up feeling like a game from the late '80s that's just been updated with modern tech. Which, given how many games lately appear to be more influenced by movies than other games, might be the most over-the-top thing about this little fun-loving fightfest.